The United States Congress designated the Grand Wash Cliffs Wilderness (map) in 1984 and it now has a total of 37,030 acres. All of this wilderness is located in Arizona and is managed by the Bureau of Land Management. You won't find the Colorado River, the force of nature that eons ago carved the Grand Wash Cliffs of Arizona, anywhere near the cliffs themselves. Today the Colorado flows about 20 miles to the south, sculpting the Grand Canyon. However this wilderness, in Grand Canyon-Parashant National Monument, marking the transition zone between the Colorado Plateau and Basin and Range Provinces, preserves the river's intricate handiwork--rugged canyons, scenic escarpments, and colorful sandstone buttes. Most remarkable are the 12 miles of towering cliffs themselves, which are cut into two giant steps, the first about 2,000 feet high, and the second a 1,000-foot leap to the Shivwits Plateau. Between the two steps lies a shelf that stretches one to three miles wide. Several canyons cut deeply into the sculpted cliffs and provide opportunities for tough scrambling to the top where a piñon-juniper woodland overlooks a plain of Mojave desert shrubs below. Elevations in this Wilderness range from approximately 2,650 to nearly 6,700 feet. Climate in the Arizona mountains varies greatly with elevation. The higher elevations generally receive much more precipitation and much cooler temperatures than the lower elevations. Summers at the high elevations bring warm daytime temperatures with cool nights. Low elevations often experience very hot summer temperatures. Afternoon thunderstorms are common in the summer. The winter and early spring months bring snow and sometimes cold temperatures to the highest elevations but frequent clear, sunny days. Winter brings moderate temperatures to the low elevations - a great time to recreate in these snow free areas - allowing both winter and summer type activities within very short distances. One 11-mile maintained trail traverses the length of this Wilderness above the Grand Wash Cliffs in pinyon-juniper country. You will find extraordinary opportunities for solitude and primitive recreation as well as rugged canyon hiking, if you don't mind the effort. Gila monsters, desert tortoises, and desert bighorn sheep live here in solitude. Access is difficult, but seekers of solitude will find it well worth the effort. 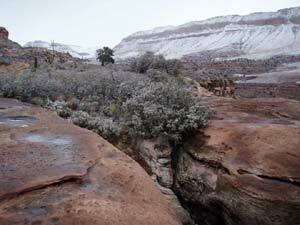 Planning to Visit the Grand Wash Cliffs Wilderness? How to follow the seven standard Leave No Trace principles differs in different parts of the country (desert vs. Rocky Mountains). Click on any of the principles listed below to learn more about how they apply in the Grand Wash Cliffs Wilderness.